So glad to get last week out-of-the-way and looking forward to a long hard days work down at the Mustang Maniac yard. My car was loaded up to the brim to take stuff down there, more so than usual this time. There was four tyres, two front seat bases, two front seat backs, rear seat base & back, tools, a change of clothes and not forgetting my all important nosebag (lunch). Two pairs of tyres strapped together, I thought I was going to get them both in the boot, but no. I had two in the boot and two on the front seat next to me. The weight of the tyres set the seat belt warning alarm of so I had to plug the seat belt in. I got some strange looks going through the little villages by MM when they see tyres strapped in. What are the tyres? 205/60 R15 BF Goodrich with raised white lettering, I wanted the old school muscle tyres look. All last week when I got home from work, I got changed and went out for two or three hours manual work into the evening on car stuff. I was busy stripping of the old seat covers of down to their frames and cleaning them up again. The seats were covered in glorious ’70s velour upholstery with buttons. It may have been all the rage thirty or forty years ago, but it’s certainly ain’t my taste. The fabric was torn, rotten and smelt of damp dogs and doesn’t go with the image of the car now. The first step was to remove the old covers, the hog rings which were rusty and sort of gave me an idea of what I was getting myself into. This was a job that I wasn’t particularly looking forward to and I have been putting it of for a while, but it has to be done of course, and Adam was looking to have them soon for the upholstery guys to get going on them with my new interior. When pulling out old hog rings, use the best quality pliers you can get your hands on. Cheap ones slip of all the time and cause your hands to ache, they are more trouble than they are worth. I used a sort of good set for one seat base, then promptly went and got my Snap On pliers, it seriously made life so much easier and took half the time – trust me! The front seats were the first job and the velour was the first plan of attack. I cut down a corner and started to peel the covers back as I went along pulling out the hog rings every few inches or so. After a couple of minutes I got the right hump, the simple reason was the seats were covered on the cheap, in other words straight over the top of the old original vinyl covers, the original seat covers were torn, so a re-cover was probably the option at the time to make the car look trendy. What that meant was that I had to remove the velour hog rings then do it again for the original covers, doing the job twice over in effect. When peeling the corners back at the bottom I got the smell of dampness come through and the foam fell apart on touch. Under the foam was a soft covering of padding laid over the hessian. Of course this was all stitched to the springs at the rear to hold the buttons in place and pull the covers tight. To get the shape of the seat there are wires that are also hog ringed into the seat foam to give it shape. These have to be removed as well. The padding was marked up with water stains and rust from the wires. When this was removed the hessian was exposed with wires to hold it in place with hog rings as well. The hessian disintegrated and sent dust clouds everywhere. My shed now smells like an old potato storage shed by the way. The hessian irritated my skin which wasn’t very nice to say the least, as a result I decided to change plan and remove the hog rings for the hessian and try to remove the hessian and wires as much as possible in one go. 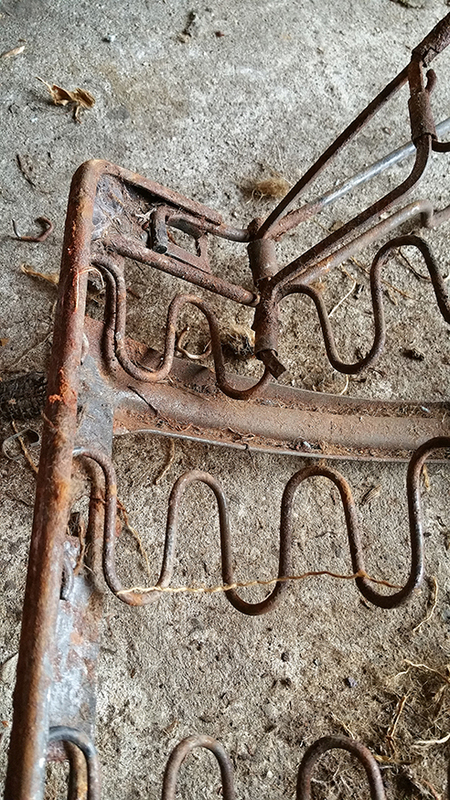 The frame itself was now exposed and I could see the extra seating shape wires and the rusty ends of the wires that had discoloured the material. The process was repeated for the other front seat both backs and bases. The rear seats were going to have to be done in the garage due to the size. Exactly the same process was used again but this time the seat back corner was particularly bad at one end on the passenger side. The hessian again was held in place with long wires this time, some of the hooked ends had rusted away and so some could be pulled straight out. The rear base smelt the worst of all of them, and peeling the velour and vinyl out of the way you can see why. The padding was rotten though and rust was everywhere, I suspect that the car had water in it at some point as the under dash was also rusted to a similar extent. The hessian on the seat was in three parts, the larger wires for the seat area and the smaller wires for the tunnel section in the middle. This took forever to take of In sections. with the hessian now removed from all the seats it was time to remove all the wires that I could, some were broken in the middle which were no good, some had broken ends. I collected them all up and kept them in their piles for later. The exposed frames were wire brushed to get rid of the loose rust and sprayed with rust encapsulator to stop it, once dried a couple of coats of satin black to make them look like new again. 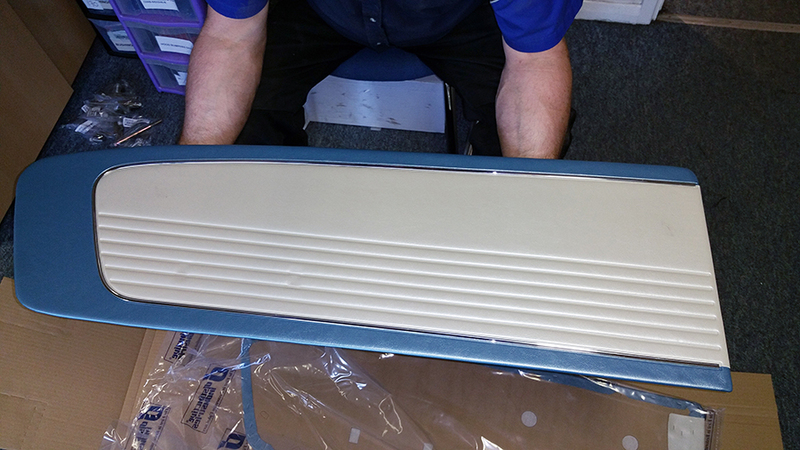 The seats are now in Adam’s capable hands ready to go of to the fitters to re-upholstered with the new interior. Do you want to see a sneaky peek at the colour scheme? OK you talked me into it! I must apologise at this point if some of the pictures look familiar if you have been reading the Mustang Maniac blog, I have used some of their pictures as I wasn’t there at the time of course. I arrived excited as I was going to put the radiator in. Adam had other ideas and told me about the dry fitting of the exhausts. The pipes had come back from a mate of his who bent the pipes to what was mapped out for my car being a bespoke setup from my 3″ headers we fitted back on last week. The pipes they were using was the largest recommended size of 2 1/4″ on a classic Mustang. The special order Flowmaster Series 40 Delta Flow boxes had arrived and I was told it was final dry fit time and to help Yogi. 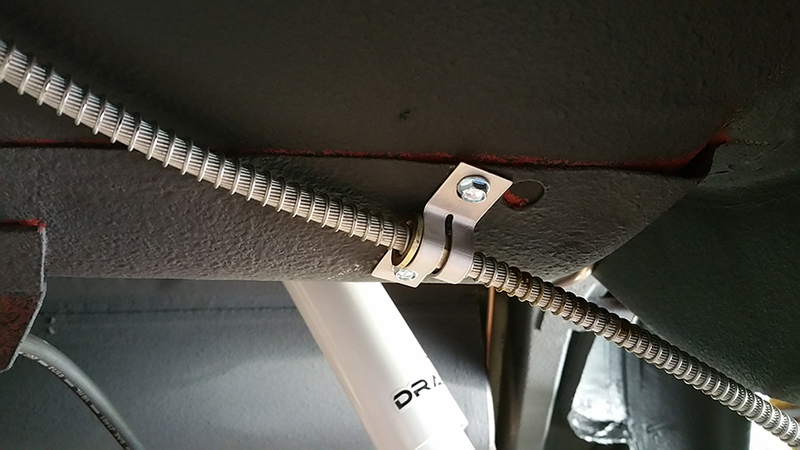 The exhaust pipes need to hang from two large brackets from the seat back panel, so holes had to be made to take the stud fixings. The pipes have been bent as I said before and I wondered to myself do you really need all these little bends? When it is all dry fitted up you can see that you do need it. The pair of mufflers have an inlet and outlet ports as the baffles inside are designed to soften the noise, create an area of low pressure inside the box as well as accelerate the gas from the pipes as quickly as possible. The mufflers were hung from their brackets in order to make it easier for the tail pipe fitting. At his point we discovered that the fitting of the mufflers here meant that the hand brake cable would be resting and possibly rattle on the top of the boxes. Yogi made me up some brackets and fitted them in place for me to stop that problem. The dry fit was going well, but as I was holding pipes I couldn’t take pictures at this point. Yogi measured up the location where the turn down exhaust tips would need to be fitted. Then we took the whole lot of again. The end sections were taken to Adam’s work shop where the exhaust cutter was kept. Like a giant plumbers tool in some ways I was shown how to use it then I could have a go to cut down the excess pipes. With the pipes cut the turn down tips needed to be test fitted. They were too tight and needed to be expanded, like a swaging tool this specialist tool expands the end to allow it to slip over the exhaust pipe final section. That was the exhaust done for now until the step down has been made for the headers. Amazing to watch it all take shape like that. During the week the guys had sprayed the main hanging brackets as they were bare metal and didn’t want to take them of from rusting. 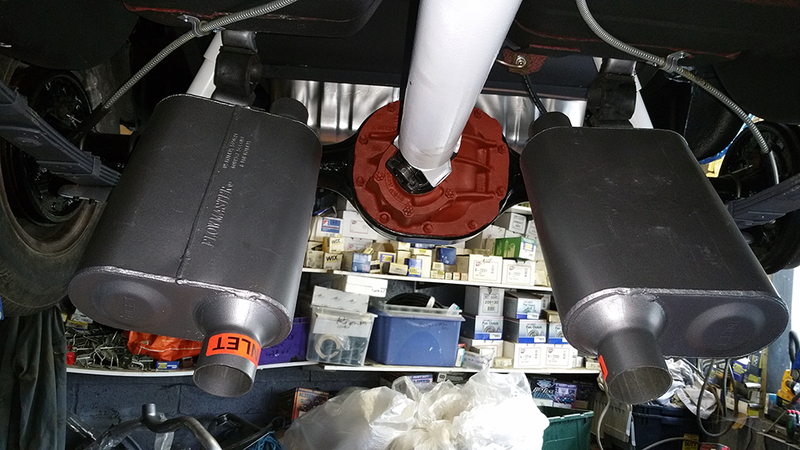 My next job was to clean and paint the exhaust clamps along with the smaller mounting brackets. As these were left in the afternoon sun they soon dried out and should be fine to use by the time they want to fit them. What I thought I came down to do was my final job of the day, the radiator. I gave it a bit of a clean over and got the bolts out along with the cowl bolts. As I was on my own not much chance to take pictures again trying to hold it in place needed two hands. But basically there are four bolts in each corner that go through the front panel opening into the corresponding holes on the radiator with a nut to hold them all in place. My fan was re-sprayed again a while ago as it got a bit damaged moving it around, but this time I detailed it bit with the chrome tips. This should also give a visual guide that the blade is turning. The radiator sits nice in the black engine bay and I am pleased with the look. The pressure cap on the top is a generic rubbish one and I will replace it. But for now I sprayed that black while I was at it with the brackets just to make it blend in. Lastly last week I forgot to take pics of the fuel filter and the fuel sender unit in the fuel tank. So as promised here they are. Next week I have no idea what I am doing. But I should image it will be brilliant what ever it is. Thanks again to Yogi for the crash course in exhaust fabrication and to Adam for storing all my stuff short term of course, now he can’t get a couple of his cars out. This entry was posted in Car, General, Photo's and tagged 205/60 R15, brackets, chrome, exhaust, fan, Fuel tank, Mustang, Mustang Maniac, One man and his Mustang, radiator, sender unit, shroud, tyres. Bookmark the permalink. Such a labor of love…especially those seats. I can’t wait to see more details about your door panels, as well! Upholstery is another one of those jobs I can’t deal with. I’m in awe at all details. But, you need to do them. So true Timothy, if you get that wrong it can ruin the whole look of the car. That’s why it’s going to be done professionaly. don’t want to mess up a set of seats In a hurry.